Tentacolor » Blog Archive » Surprise! It’s Squidograms at Loco Pocos! Surprise! It’s Squidograms at Loco Pocos! The news is out — Squidograms are now for sale at Loco Pocos Island, too! 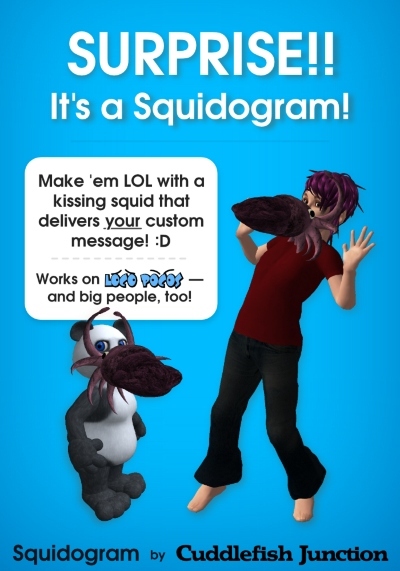 Squidograms work great on Loco Pocos and regular avatars alike, and they’re definitely the most unique (and slimy-squid-surprise-smoochiest) kissogram around! I’ve updated the Squidograms to be extra reliable, even in the face of lag and server troubles, which there seem to be no shortage of these days. And to really sweeten the deal, I’ve increased the bulk discounts to business-sense-shattering levels! So log in and head over to Loco Pocos Island to pick up some Squidograms (and maybe a cute new accessory or five)! Or drop by Cuddlefish Junction for a Squidogram 10-pack or any of our other fine products, including the handy-dandy Deliverator! P.S. Don’t know what Loco Pocos are? You’re missing out! They’re hands-down the best tiny toon animal avatars in all of SL, and there are a ton of animals, clothing, and accessories to choose from. (And Damien keeps putting out new ones all the time! I don’t know how he does it, he’s like a cute-making machine. Does he ever sleep?!) Each avatar and item has a bunch of color options, so you can really customize your avatar to express your personality. You hardly ever see two Loco Pocos that look exactly alike. And yet they’re all so gosh-darned adorable!